In the inaugural Ronnie Coates memorial race, Trinity student Seán Owens finished first. 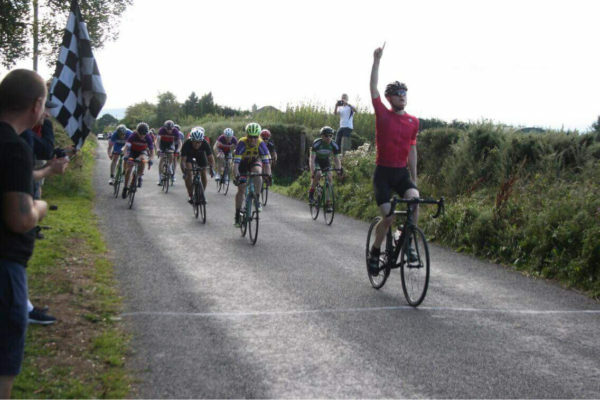 Dublin University Cycling Club (DUCC) member Seán Owens placed first in the inaugural Ronnie Coates Memorial race at the weekend. Following a tightly contested race that saw Owens finish with his first-ever win in the final sprint, he is now a mere three points from promotion to division A3. The event was a 59-kilometre race starting in Roundwood GAA club, held in honour of a Bray Wheelers club member who had passed away earlier in the year. Following a hilly course through Wicklow, the cyclists did four laps of the circuit, while A3 and A2 riders did seven. Despite numerous attempts to break out of the pack early on in the race, Owens could not gain any significant separation from his competitors. His attacks in both the second lap and the third lap were unsuccessful, but kept him close to leaders throughout the race, which proved crucial as he came into the final minutes. Returning from a bad crash recently, Owens may have been slightly out of practice, but this did not show throughout the race. In an email statement to The University Times, Owens said that he felt fit before the race and that the hilly course was more suited to him as he prefers “punchier finishes”. Despite this, Owens was forced to leave it late to gain ground. With just five kilometres to the finish line, a quick burst of acceleration saw him enter the position of fifth wheel as he reached the final left turn into the finishing straight. This was a particularly narrow road, which Owens said allowed him to “just focus on getting to the line”, cycling through a gap between two of the racers ahead of him. Owens pulled away after a confident sprint, winning the race by a number of bike lengths. Owens added that placing first was “a very special feeling” and dedicated his first victory to his grandfather, who passed away earlier this year, around the time of his first race. This race accompanied the annual Christy McManus Memorial 94-kilometre race for A3 and A2 riders, also organised by Bray Wheelers.